Can The Daytona Magic Come Back? Home / Tom Bowles / Can The Daytona Magic Come Back? It's time. As the world wakes up from a rather one-sided Super Bowl Monday morning, the reality will hit all sports fans, no matter how much they're attached to stock cars; the next big "event" on the U.S. sporting schedule has now become the Daytona 500. NASCAR, for better or for worse, is hours from officially returning front and center on the national radar screen. In just 13 days, engines will come to life, 43 cars will roll to the grid, and the drama of side-by-side racing at 200 MPH for the mere benefit of trophies, money, and points starts all over again. That's a given; the bigger question is whether or not the racing at Daytona you'll see will truly deliver something memorable. Just like Leap Year, every once in awhile you run across a year that's special in any major sport, and I think there's universal acceptance that for NASCAR, this is one of those times. In the first year of a new TV contract with ESPN, the Worldwide Leader in Sports will be all over the track like a hive of swarming bees, even though the Daytona 500 is actually being televised by Fox. With half-hour specials, a daily news program, Sportscenter at-the-track presence, and Stuart Scott actually forced to learn pronunciations of names from everyone from A.J. Allmendinger to Kirk Shlemerdine, an opportunity exists more than in the past few years to attract more of the "casual" racing fan to give the 500 an extended look on television. ESPN's presence, of course, is only the tip of the iceberg in that department; with the arrival of Toyota and a man named Juan Pablo Montoya, there will be millions of eyes tagging along in the next two weeks that have not so much as laid eyes on more than five minutes of stock car racing before learning of a certain 500-mile adventure down in Daytona Beach, coming this February to a television set near you. February 4, 2007 Tom Bowles Comments Off on Can The Daytona Magic Come Back? It’s time. 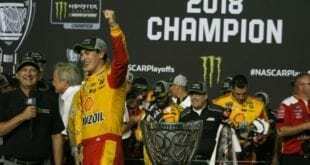 As the world wakes up from a rather one-sided Super Bowl Monday morning, the reality will hit all sports fans, no matter how much they’re attached to stock cars; the next big “event” on the U.S. sporting schedule has now become the Daytona 500. NASCAR, for better or for worse, is hours from officially returning front and center on the national radar screen. In just 13 days, engines will come to life, 43 cars will roll to the grid, and the drama of side-by-side racing at 200 MPH for the mere benefit of trophies, money, and points starts all over again. That’s a given; the bigger question is whether or not the racing at Daytona you’ll see will truly deliver something memorable. Just like Leap Year, every once in awhile you run across a year that’s special in any major sport, and I think there’s universal acceptance that for NASCAR, this is one of those times. In the first year of a new TV contract with ESPN, the Worldwide Leader in Sports will be all over the track like a hive of swarming bees, even though the Daytona 500 is actually being televised by Fox. With half-hour specials, a daily news program, Sportscenter at-the-track presence, and Stuart Scott actually forced to learn pronunciations of names from everyone from A.J. 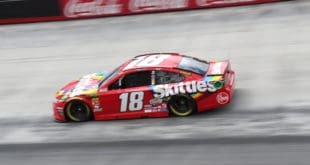 Allmendinger to Kirk Shlemerdine, an opportunity exists more than in the past few years to attract more of the “casual” racing fan to give the 500 an extended look on television. ESPN’s presence, of course, is only the tip of the iceberg in that department; with the arrival of Toyota and a man named Juan Pablo Montoya, there will be millions of eyes tagging along in the next two weeks that have not so much as laid eyes on more than five minutes of stock car racing before learning of a certain 500-mile adventure down in Daytona Beach, coming this February to a television set near you. But opportunity doesn’t lead to an answer to the burning question asked earlier : can the racing deliver? All I know is that when I was a kid, the races that helped get me hooked for good on this sport all revolved around the Daytona 500. I was sitting there as a wide-eyed nine-year-old in 1990 when Dale Earnhardt disappeared on the third turn of the last lap. A little-known driver in a Purolator No. 10 car named Derrike Cope went on to win that now-famous race, and I sat there in awe as the man I had learned they called The Intimidator actually looked intimidated by factors beyond his control. I’ll never forget how it all slipped away, the drama through which a man who was a living legend became eclipsed by a one-hit wonder (well, two hits if you count the win at Dover) in the matter of a single turn. Then, there was the race in 1991. The race ran long, cutting coverage short, but there was no denying a finish that left fans breathless: a young and hungry Ernie Irvan charging to the front in the last 20 laps, with Dale Earnhardt, Davey Allison, and Kyle Petty desperately trying to track him down. As the three battled amongst themselves, they made contact, sending Allison’s car to Lake Lloyd, Petty into a tailspin and Earnhardt out of Victory Lane – again. Irvan went on to win the race under caution, an ending so dramatic I knew then at ten this event would be part of my yearly calendar for the rest of the time I walked the earth. There are other finishes that remain etched in my mind – Dale Jarrett holding off Earnhardt for his first win in ’93, Irvan and Earnhardt spinning out while Jeff Gordon won his first 500 in ’97, and Earnhardt himself finally cashing in on the Winners’ Circle in 1998. Each one provided the type of ending that would not only get established fans standing up and cheering in their own living rooms but create the type of atmosphere that had millions more realizing they were hooked on NASCAR, all over the course of just 500 miles. The last few years, though, Daytona hasn’t been delivering the type of mind-altering drama at the finish that gets a casual fan hooked like fish on a line. It’s not that they’ve been bad races…they just haven’t featured their share of groundbreaking moments at the very end. Yes, Jimmie Johnson won his first 500 in 2006, but everyone and their mother knew in the closing laps Casey Mears wouldn’t post a threat heading toward the checkered flag; good friends with Johnson and settled in second with limited drafting help, he knew better than to pull out of line. Yes, Jeff Gordon didn’t take the lead for the last time in the 2005 Daytona 500 until lap 198, but a timely debris caution allowed him to coast to the win in overtime with relative ease. 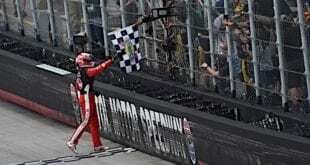 Of course, Dale Earnhardt, Jr. winning the 500 in 2004 was a landmark moment in his career, but once he passed Tony Stewart with 20 laps to go, the finish was a foregone conclusion. In fact, you have to go all the way back to 2002 to find a 500 that’s truly etched in most people’s minds as memorable at the finish, with Ward Burton coming through a winner after Sterling Marlin made the bizarre move of touching his car during a red flag to fix some damage. In the face of several controversies threatening to bring the sport to his knees, some Daytona magic is exactly the type of thing NASCAR could use to bring the focus back to the racing at hand. Of course, lots of factors need to come together for that to happen…but as long as 43 cars get rolled to the grid in 13 days, there’s still a chance. I’ve got my fingers crossed. * For all the years Dale Earnhardt was haunted by us media until he broke his Daytona winless streak, when are we going to turn our attention to Tony Stewart? 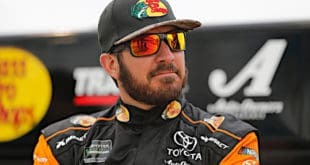 He’s now 0 for 8 at the 500 despite winning the July race twice in a row; with the two-time champ already holding a trophy from the Brickyard 400, it would seem this is the only NASCAR jewel he has left to win, and he’s not getting any younger. * I know how big an issue the Car of Tomorrow is…but unless someone from above specifically pushes me to write about it, I’m trying not to touch the story down at Daytona. For all the controversy those cars continue to ignite, they’re not being used in the first race of the season, and wouldn’t it be nice if attention were focused on the present instead of the future for a bit? After all, the season is about to start again. * If you have any doubt as to how big an impact Juan Pablo Montoya has already made to the sport, I read a great article in the Sports Business Journal last week where Montoya giveaways are already occurring in Russia. That’s right…Russia. NASCAR has always been a sport mostly followed only by Americans, simply due to the fact they never had anyone capable of capturing international appeal…until now. As for Montoya, kudos to him for bringing a fan base capable of rivaling Junior or Gordon to the sport before he’s even run his first full Nextel Cup season. Hopefully, they’ll stick around if he struggles early.